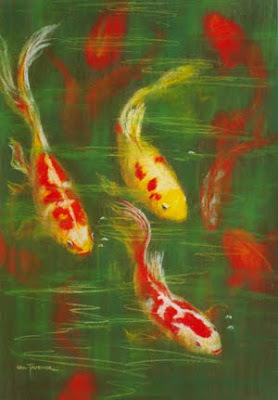 'FISH TALES" Limited Edition Print. This is one of my all time favourite pastel paintings and is now available as a limited edition print from my studio or.... there is a large (A3) framed print available at Bendigo Pottery at my studio price of $195.00. It has been beautifully framed in a stunning red frame which sets it off perfectly. Bendigo Pottery have a lovely showcase of my prints in their front gallery. If you cannot get to the studio, then this small selection of around 15 prints is a must when you visit the Pottery.